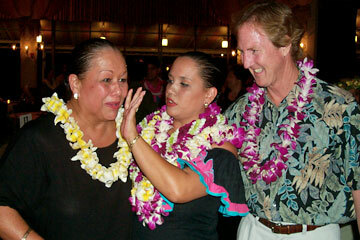 Marlene Sai, left, her daughter Mahela Ichinose and Flip McDiarmid celebrate Ichinose's win at a hula and vocal festival. It isn't always easy being the president of the company your father built. Just ask Donald Philip McDiarmid III -- known to family, friends and business colleagues as "Flip" -- about the challenges of being president of Hula Records. The company, founded in 1947 by his grandfather, band leader/songwriter Don McDiarmid Sr., and revived in 1960 by his father, Don Jr., has been one of the major record labels in Hawaiian music for more than 40 years and has produced a tremendous catalog of Hawaiian and hapa-haole music. Don Jr., 84, turned the company over to Flip years ago but doesn't hesitate to make his feelings known on company matters. "It's tough if you're in the same business as your father. ... He may tell you that he's ready to retire and you're ready to take over, but how do you do it when your time comes?" Flip said in a call from Atlanta, where he was attending yet another trade show promoting Hawaiian music and the various products that the company represents. "He doesn't want to give up. ... He sends me e-mails every day. Your parents -- in business it's almost always your father -- want you to achieve and be successful, but they've been doing it longer and it can be hard for them to let go." The family's history makes it clear why Don Jr. feels he still has the right to speak his mind. The McDiarmid dynasty dates to 1934, when Don Sr., a professional musician, married with two children, was playing on a passenger liner that stopped in Honolulu. McDiarmid met Harry Owens and was offered the job of first trumpeter and assistant orchestra leader with Owens' Royal Hawaiian Orchestra. Hawaii became the family's new home. Like many musicians of the big-band era, McDiarmid aspired to be his own boss, and within a few years he was. The Don McDiarmid Orchestra headlined the Royal Hawaiian Hotel and was featured on local radio. His contributions to the music scene reached beyond his own work, though. In 1938 he introduced a charismatic young singer named Alfred Afat, destined for international fame as Alfred Apaka. McDiarmid also wrote some of the biggest hapa-haole hits of the era. One of them, "(When) Hilo Hattie (Does the Hilo Hop)," became the musical identity of Clara Haile Inter; Inter became so thoroughly identified with the song that she eventually changed her legal name to Hilo Hattie. Others included "Little Brown Gal," "South Sea Sadie" and "My Wahine and Me." McDiarmid founded Hula Records in 1947 to revive interest in some of his prewar compositions. He chose the name intending to market his recordings to local hula studios, and also as an advertising gimmick -- if a tourist asked about buying "hula records," they'd be shown the Hula label. 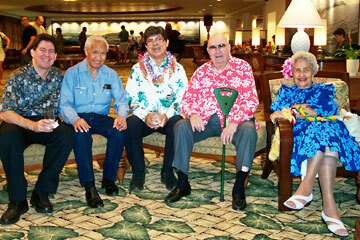 Don McDiarmid Jr., fourth from left, with Harry B. Soria Jr., far left, Eddie Kamae, Kawai Cockett and Genoa Keawe at the Outrigger Waikiki Hotel. Hit albums by Keawe and by Kamae's group, the Sons of Hawaii, helped establish Hula Records as a major local label in the 1960s. Cockett recorded a Hoku Award-winning album for Hula in the 1990s. In those days, an album consisted of four 78-rpm records sold in a booklike package rather than a single disc. Unfortunately, so many of the fragile shellac discs were broken while being shipped to Hawaii that it wasn't possible to assemble enough complete sets to recoup costs. The label went dormant for the next decade, and might have remained so, until Don Jr. stepped in. Junior's day job was managing the record division of Nylen Brothers & Co. His moonlighting job was producing albums, which eventually put him in conflict with his employers. So he formed his own distribution company, secured Hawaii marketing rights to enough national labels to survive and reactivated Hula Records. At first he ran the label as an unpaid second job and eventually was able to hire a staff. Hula's early releases set the pattern for almost everything that followed. The first album, "Let's Hula," featured Nina Keali'iwahamana. Others showcased the talents of Vickie I'i Rodrigues, Ed Kenney, Gabby Pahinui and the Sons of Hawaii, Genoa Keawe, the Kahauanu Lake Trio, and the Kamehameha Alumni Glee Club. Hula dancers and studios were an important market. Hula cannot be fully appreciated unless the meaning of the lyrics are known, so Junior included Hawaiian lyrics, English translations and additional information. Hula Records also presented the mid-1960s pidgin comedy of K.K. Ka'umanua and introduced the music of the Hawaiian renaissance with albums by Palani Vaughan and the Sunday Moana. In liner notes for "Don McDiarmid Jr. Presents Hula Records' Hits!," released in 2002, Don Jr. said the label was founded when appreciation of Hawaiian music was in decline. "The thriving Hawaiian music recording industry that we have today is proof that Hawaiians love their music. Now that we have restored it to its rightful place in Hawaii and in many other parts of the world, I can only hope that it will always remain so." Eventually, Flip says, his father's experience in business and marketing led to an expansion beyond the record business. 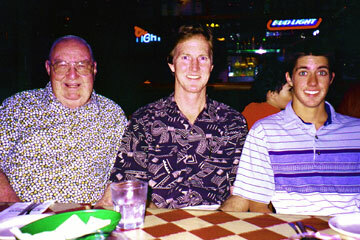 Three generations of McDiarmid men enjoy some downtime together: Don Jr., left, son Flip and grandson Mac. Once the Hula label was established, Don Jr. began looking for new markets. He came up with the idea of selling souvenir cigarette lighters with imprints of geckos, hula girls, tikis and phases such as "I got lei'd Hawaii." "The lighters were hotter than hot," Flip said. "They were selling like hot cakes, and so then we asked if we could sell music, too." The lighters were sold in Waikiki and at the airport -- "places that never sold Hawaiian music because the (profit) margins weren't there for them," but they started calling about picking up Hula recordings. Flip says it was always understood that he would eventually join his father in the music business. "I was with my grandfather a lot, and would play games like Name That Tune with Hawaiian songs and things like that, that were completely different." He grew up grounded in songs that weren't centered on television shows or the contemporary music of the day. "My dad was always asking us kids to do work for him -- to make money -- and so my sisters and I got involved in the business that way, too." Flip says he did the same thing with his son, Don McDiarmid IV, a k a "Mac." As a teen, Mac started working in the warehouse; he later showed an aptitude for working younger buyers at island record stores. Mac eventually took a break from the business and is now working as a lifeguard in California. Flip says the break has positive aspects. "When you're in that relationship working together (with family), you can never do enough. It's very difficult. Running a family business has got to be one of the hardest things in the world, and taking on another generation is one of the hardest things about it." Should Mac decide not to return, Flip says, "we've got the girls (Heather and Shannon). They want to get involved, and we've got the rest of the family to step up to the table, and I'm fortunate to have good health." The most important thing, Flip says, is enjoying the business. "I have a love for what we do. It's really good fun. You're dealing with a niche market in selling Hawaiian music, and as a full-time business there are only a few of us who are doing it and surviving. We don't have a lot of competition, and what we bring out is always accepted." In recent years Flip has overseen production of compilation albums showcasing local falsetto contest winners and, starting this year, the winner of the Ka Himeni Ana contest. But he says he's got a long way to go to catch up to his dad and granddad. "Grandpa (wrote) 'Hilo Hattie,' 'Little Brown Gal' and 'Sadie.' Those are huge, huge footsteps to walk in. Then you get to Dad with (Sunday Manoa's) 'Guava Jam,' Gabby Pahinui, Genoa Keawe's 'Alika,' Danny Kaleikini, Edith Kanaka'ole. Huge, huge footsteps! How do you top that?" he said. "My personal feeling (is that) I have not even gotten close to what they did -- and I'll keep trying! I've put out 100-plus albums, and I'm going to keep trying till I can make a mark that's comparable."